Today's episode of JapanaTour is all about the electric spectacle that is famous for it's fashion, music and stormtroopers. When Japan is mentioned, a lot of people automatically assume that the entire country is a busy metropolis with big neon signs and huge TV's glaring down at the people below. Tokyo is a lot like this for the most part, but the one place that really felt like that Japan I'd been picturing as a kid was Shibuya. Join me after the jump for some talk about this haven for the Japanese youth! Shibuya slowly built itself up, but received a significant boost upon the completion of the Yamanote line rail service in 1885, and from then on it slowly became the entertainment district we know it for today. Shibuya station has since become one of the busiest in the country, and because of that the ward sees plenty of business. In 1947, Shibuya was accepted as one of Japan's special wards, joining the original 21 wards before the induction of Nerima. Shibuya is particularly famous with the Japanese youth for the night-life, music and fashion found here, but one of the most famous stories about the place concerns a dog. The dog in question was Hachiko, who was born in 1923 and was absolutely adored by his owner. Hachiko would walk with his owner to the train station to see him off for work, then walk himself back home. He would then meet his owner as he arrived back from work, and as you might expect, Hachiko became famous with the locals because of this. However, one day, his master didn't return from work, having passed away while at the University he taught at. Hachiko then spent the next 12 or so years turning up to the station, waiting for a master that would never arrive. The dogs minor celebrity status earned him the famous Hachiko statue that can be seen in Shibuya, and Hachiko himself attended the unveiling back in 1934. Even after all the fuss, he continued to appear at the station until a year later when he passed away. His statue now serves as not only a memorial, but an extremely popular meeting spot. It's definitely worth checking out while you're there, but it'll no doubt be very busy. Did you know that there is another popular meeting spot in Shibuya? It's a statue known as 'Moyai', which is based on the famous Moai statues of Easter island. It was gifted to Shibuya by Niijima island back in 1980, and like the Hachiko statue, is nigh on always crowded. From Shinjuku/Tokyo station, take the Yamanote line to Shibuya station (about 10 minutes from Shinjuku station, about 20 minutes from Tokyo station). Simple as that! Shibuya station is very busy, and it can be easy to get yourself a bit confused while trying to navigate it. Be sure to keep an eye on the signs, and if need be, being wary of which way people are walking. The exit that you'll want to look for is the Hachikō exit (ハチ公), which will lead you to the famous Shibuya crossing. It is recommended that if you are looking for places in particular, you use this as the starting point! As you may have guessed, Shibuya is home to the Shibuya crossing (madness, I know!) which is pictured in the topmost image. It's potentially the most famous scramble crossing in the world, and is just one of those sights you really have to see while you're over here. For a minute, just imagine being at the front of the crowd when you start to cross to the opposite side. You have people walking towards you from the left, right and the front. You can't help but think you're going to walk into someone and look like a total idiot, but somehow you manage to make it across to the other side without any crazy manoeuvres. It's one of those things that looks like it would be an absolute nightmare, but works fantastically. You won't be bored while you wait to cross either, as you get to admire the large televisions on the buildings around you, which beam down all sorts of weird and wonderful advertisements. If you end up in Shibuya you'll find it hard to avoid using it, but I'd certainly recommend doing so. Did you know that Yoyogi Park has been used as an Olympic venue? It was used for the 1964 Summer Olympics, and featured as one of the main locations. Shibuya as a whole featured somewhat, becoming cordoned off to become part of the marathon course. Of course, I can't really do an article about Shibuya without talking a little about what it does best! First on the hit list would be Center Gai, one of the most famous areas here for fashion and starting new trends. The place is surrounded by clothes and music stores, as well as the odd arcade here and there, so there's reason enough to explore this place even if you're just as unfashionable as I am! If you are more into your music than your fashion, there's one place you'll want to check out. I would have recommended visiting the absolutely massive HMV store they have here, but unfortunately it closed it's doors in 2010 after struggling to find the sales it needed. Fortunately, Tower Records is perhaps even more impressive. This seven-storey monstrosity was at one point the largest music store in the world, and even though it doesn't hold this title any more, it's still ridiculously impressive. They have a huge collection of world music as well as Japanese tunes, so if you happen to be looking for any piece of music in general, it might be worth popping in. You never know what you might find! 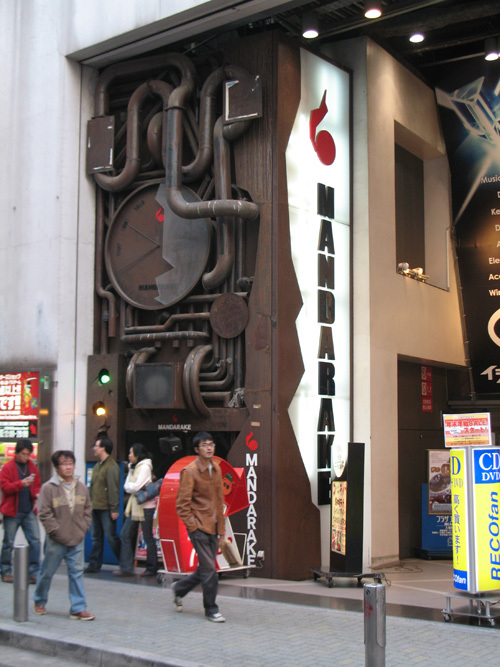 For the more traditional otaku, there is a very cool Mandarake store here! The outside of the store, when you manage to find it, has a very awesome steampunk look to it. From here, you walk down a few flights of stairs into what looks like a cave area, with some flashing lights providing the illumination you need to actually find the entrance of the shop. This particular store has a large focus on doujins and manga, but they also have quite a good collection of figurines, anime and trading cards. In fact, a lot of the figures I saw here (being a Nendoroid addict) were particularly rare ones, so I'd recommend a look around. Another interesting place to visit, though admittedly a little limited on what you can actually do there, is the NHK Studio Park. For a pretty reasonable ¥200 you get to go on an hour long tour of the NHK broadcasting studios. The very first thing you'll get to see is... yourself! They use a video camera to place you, and whoever else you happen to be touring with, on their massive 150 inch television! There are many different things to see and do while on the tour, and at the end of it all you get to visit the gift shop, which has, for good reason, the largest collection of Domo figures for sale on the planet! Did you know that noitaminA is Animation backwards? Of course you do, so here's something else! The noitaminA anime block started back in 2005 on Fuji TV, but at this time only lasted half an hour and showed just a single episode of anime at a time. In 2010 it became an hour long, meaning double the anime! The first shows to appear as a 'double' were House of Five Leaves and The Tatami Galaxy, and since the creation of the block, it's aired 32 seasons of anime and one live action show! The last place on my list is a very cool place, tucked away on the fifth floor of the Parco 1 building. It's the official store for noitaminA, the animation block that has broadcast awesome shows like The Tatami Galaxy, Ano Hana and Bunny Drop, and is currently showing the television series of Black★Rock Shooter. The store itself sells all sorts of goodies that are related to the shows it is or has been airing, which means there can be some very rare and awesome merchandise to be had. They also have a lot of displays to look at, which again are relevant to what they've been showing. When I was there, I got to see some drawings and a script from the Ano Hana anime, as well as some costumes that were tailored based on those seen in Fractale. They were even selling those cool cards that get waved about in C, though I was a bit poor at this point to consider buying one. The store is constantly changing as you might expect, so it's definitely a store to come back to whenever you find yourself in Shibuya! You may have noticed that I've not said a lot about the arcades in this article (or any, really!). This is because I'll be doing an arcade-focused post in the future, so don't worry about it, I'll talk about the gooduns soon! For the record, there's a particular arcade here in Shibuya that is a sure visit! But hey, I'll talk about it soon enough! That brings us to a close, so I hope you enjoyed this look into the colourful land of Shibuya. If you want to write about your own experiences, have any further questions or even have some tips of your own, leave them in the comments below!